The best player on your team is being courted by one of the biggest clubs in Spain. Most players are easily replaceable. The concept of buy low/sell high is in full effect in the transfer markets, and teams that heed this tend to do well in the long term, Spurs among them. The problem is that some players are special. They bring a unique skill set that is not easily replaceable, either individually or via the sum of their parts. Gareth Bale is one of those. But with 100M+ on offer…? In the last four seasons, Spurs have made the Champions League one time. However, they finished seven total points out of 4th place in the three years they missed the CL, including just one point behind last season. That’s less than one win a season short of CL riches. Those late draws at home to start the year against West Brom and Norwich. That crazy, error-filled 3-2 loss at Anfield where Spurs were totally ascendant right up until they turned into a total shambles. A one-goal swing in any of those matches would have qualified them for the Champions’ League this year, and the Gareth Bale saga would be on the back burner. Football is a game of the finest of margins. Spurs had the best Shot Dominance figure in the league. They also had the best defense when it came to limiting shots opponents take. A lot of that is down to Andre Villas-Boas’s tactical system, which is outstanding. There’s a reason PSG courted him heavily when Ancelotti wanted out – he’s very good. His lineup choices often leave something to be desired, but it’s hard to argue with the end result. Offensively, Spurs took the second most shots per game, and actually averaged the most Shots on Target of any team in the league. Again, this is really good. So if the basic metrics on both sides of the ball indicate they were really good, why did they finish the year with the 6th best goal difference? And more importantly, how did the team that gave up the fewest shots overall end up conceding the 7th most goals in the league?!? Aha! This… this is not good. 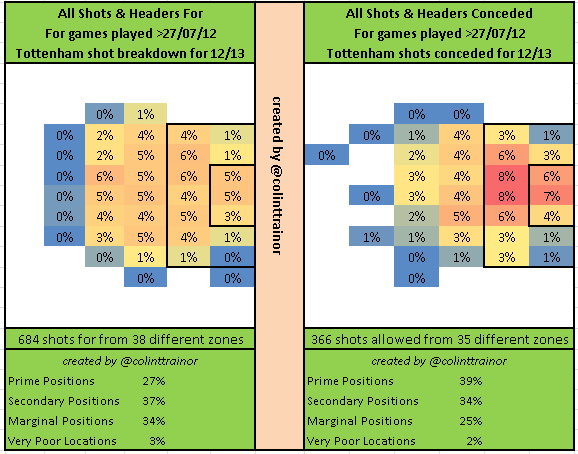 Spurs conceded the 5th highest percent of shots from Prime + Secondary locations in the league. So despite the fact that they limited the total number of shots opponents took, the ones they did manage to fire off had a fairly high likelihood of scoring. That’s a big deal. Additionally, look at the percent of shots they took from “prime” positions on offense. 27% is baaaaad. Actually, it’s worse than that. It’s putrid. In fact, it is so awful that the only team that took a lower percentage of shots from the best position on the field in the entire league was QPR, who not-so-coincidentally scored the fewest goals. But AVB doesn’t believe in analytics, so he should totally skip over this part of the preview and carry on with what they have been doing. Since we are still focusing on the things Spurs did well, it should be noted that their midfield was solid. Sandro’s injury robbed Spurs of a great player, and forced them to play a Scott Parker who looked nothing like he did three years ago, but the Brazilian was a beast. Moussa Dembele was one of the secret signings of the season, as was Tancredi Palmeri’s favourite player, Jan Vertonghen. Aaron Lennon was again quite good (and started 33 league matches! ), and though inconsistent, Kyle Walker is approaching frontrunner status for England’s right back spot at the World Cup. Oh, and though analytics has a mixed opinion of him (look at the locations opponents took shots at him!) I really liked Huge Lloris. For a team that nearly qualified for the Champions’ League, Spurs sure do have a lot of areas to improve on. A 35-year-old William Gallas started 16 times for them last season. That was not a positive. Scott Parker(32) also started 15 matches, and looked totally over his head in terms of quality of play versus what was required. And though he was great for many years, Brad Freidel really started to show his age last season. Which was 287*. Finally you come to Jermain Defoe and Emmanuel Adebayor. It’s fairest to say Defoe was adequate last season. A goals per90 rate of .41 is average for a Top 5 team, but he really doesn’t bring that much else to the squad. He also turns 31 this season, and there’s no reason to expect he’ll get any better from this point on. If he stays at Spurs, expect him to be featured as mostly a late-game poacher from here out. If he wants to be the primary option, he’ll need to do it elsewhere. The real problem up front came from Emmanuel Adebayor. Though he has a lifetime G/90 rate of .51 in the Premier League (exceptional), last year he only managed to produce a dreadful .28, and 1 assist in 18 starts. Obviously this was after signing a new, 3-year contract as part of a permanent transfer. There has perhaps never been a player as in need of a low base, incentive-laden contract as the lanky, immensely-talented, but difficult-to-motivate Togolese. Beast mode Ade is unstoppable. Disinterested Ade is a liability. Which version will Spurs get more of from here on out? There have been two major sales so far this summer from Spurs Chairman Daniel Levy. The first is a bit confusing, as they shipped young center back Steven Caulker off to Cardiff. Levy got a decent price for him (£8-9M), but even though he was only 21, Caulker was actually pretty good last year and looks like he could mature into a fine central defender. Additionally, with Gallas now off the books, Spurs aren’t exactly deep at his position. It likely won’t be a bad transfer, but it’s really unusual to sell a handy, homegrown defender in that age range. The other sale was that of Clint Dempsey. Though Spurs just bought him last year, Deuce turns 31 this season, and would have had a hard time making the starting lineup. Seattle and the MLS stepped forward with a good offer (£6M), and Levy shipped him back to the United States. Good business all around. Do they have to sell more players just to stay on budget? I don’t know if you noticed, but I didn’t mention Bale’s name one time after the introduction, yet he’s the elephant in the room for Spurs entire season. At only 23 years old, Gareth Bale was awesome. The Welshman is one of the few players in the PL that can completely turn a game on its head by himself, and his combination of speed, power, shooting accuracy, and passing ability is truly rare. Additionally, because of his age and the fact that he’s still learning to be an attacking player (he was a left back two years ago! ), there’s a good chance Bale continues to get better in the coming years. Perceptually though, he might mean that much to Spurs fans. By taking a stand against the riches of Madrid, Levy is reinvigorating the entire Spurs base in the process, despite the fact they missed out on the Champions’ League again. “See Gareth Bale now, before he’s gone forever!” is a pretty good slogan for selling season tickets. However, even without Gareth Bale, Spurs are a very good team. Even though they overpaid for him (mostly based on age), Soldado will either fill the gaping hole Spurs had at forward for most of last year, or he’ll push Adebayor to be great again, both of which are excellent outcomes. Spurs also go into the season boasting one of the strongest midfield cores in the league (Dembele, Paulinho, and Sandro), a destructive group that can also make plays when required. I even like their attacking midfield, who I think will look quite a bit better than last season, when they seemed to have trouble adapting to what AVB required from them (Sig and Holtby have the potential to be outstanding). If Spurs keep Bale, they are the 4th best team in England right now. If David Moyes implements the same dreary offense at Manchester United that he had at Everton, they might just be the 3rd. Given Arsenal’s pantomime circus of transfer business, right now I like Spurs to take one of the Champions League spots this year. If AVB takes some analytics on board and fixes the shot locations, I could even be convinced Spurs are darkhorse candidates for a league title. Their system, plus an improvement in player quality (and in the case of Bale, Walker, Naughton, Sig, and Holtby, maturity) means this isn’t as far-fetched as it sounds. I think Spurs will keep Gareth Bale this year for one final run, and a) give him a 300% raise (150K/week) plus b) promise to sell him to the highest bidder next summer in the process. Just like what happened with the other Ronaldo.